Rock these pieces from July into October. A few weeks ago, we shared eight awesome pieces you can buy now and wear for the rest of summer and into the fall. As I mentioned in that last article, I fully support doing your back-to-school shopping early, investing strategically in clothes that you can wear now and later. That way, you truly get the most from your pieces. 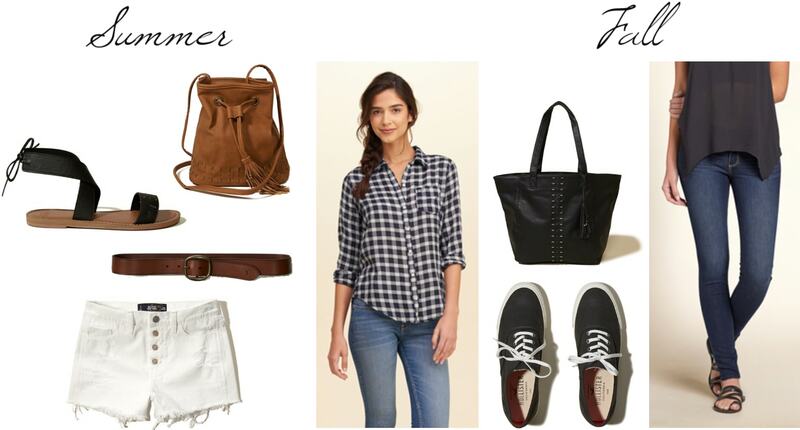 Today, we’ve teamed up with Hollister again to show you how to style three of those fab items. Below, I’ll show you six ways to style three summer-to-fall transition pieces, with looks for both summer and fall. Off-the-shoulder pieces are trending hard this summer and will continue to be popular come fall. This navy and white striped dress is the perfect piece to wear now with sandals and fun jewelry. In the fall, grab a funky printed clutch and throw a vegan suede jacket over top of your dress. Finish with tassel earrings and your favorite pair of ankle booties. You cannot go wrong with a classic gingham shirt. It’s a piece every girl should keep in her wardrobe. Give it a boho feel for the summer with distressed shorts, ankle wrap sandals, and a fringey bucket bag. Prep it up in fall with skinny jeans, classic sneakers, and an oversized tote to hold your books. As I mentioned in the previous article, I’m personally obsessing over this striped mini skirt! It’s a statement piece that’s surprisingly easy to pair with everything. While the weather is hot, you can wear it with a high-neck crop top, sandals, and relaxed jewelry. I love the idea of pairing it with a preppy polo and cute sneakers when the school year arrives. Which of these looks is your favorite? Have you started your back to school shopping yet? Let me know in the comments!